Beautifully printed postcard designed and published by Edward H. Mitchell, San Francisco, California in 1910. 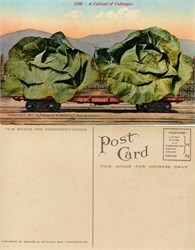 This beautiful postcard has an image of a Southern Pacific Railroad car loaded with a giant cabbage. This was considered incredible special effects at the time. This unused postcard item is over 91 years old.